I have a personal interest in investing, so investing is just especially exciting to me. But there’s another reason I wanted to start investing sooner rather than later, and this reason applies to everyone. If you live in America, you probably would know by now that people here do not keep the majority of their money in checking and savings accounts. Money in these types of accounts is the most liquid, most secure, and immediately available for spending. Naturally, there is a trade-off: money saved in these accounts does now grow, or grows at a negligible pace. Keeping your money in this form, aka “cash”, only makes us poorer: our money loses purchase value over time for failure to keep up with inflation. To save money for future plans such as retirement, and to not lose money, we have to invest. Given that I eventually need to invest, when is the best time to start? As soon as possible. The reason? The power of compound interest. Exponentiation is a fascinating mathematical operation. 10% may look like a small percentage, but an amount that grows by 10% per year will double after 7 years and quadruple after 14 years. The fast growth of your investment portfolio as a result of exponentiation is called interest compounding, and the total return on your investment is called compounding interest. The earlier you start investing, the more compound interest helps you. Let me illustrate this principle with 3 investment plans. In each of these plans, our goal is to save money for retirement. I have about 40 years for this. Also, assume that the annual investment return is 7%. 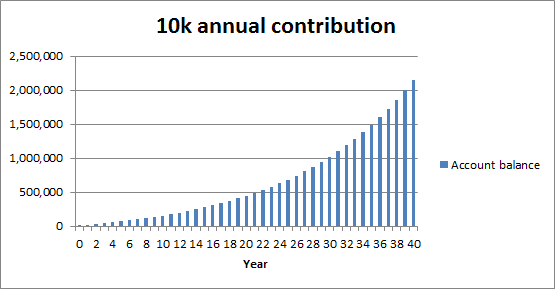 You see, the value of your initial 10k contribution at the end of the 40-year period is 150k. By missing one year of contribution, you miss out on a huge chunk of money for your saving plan. 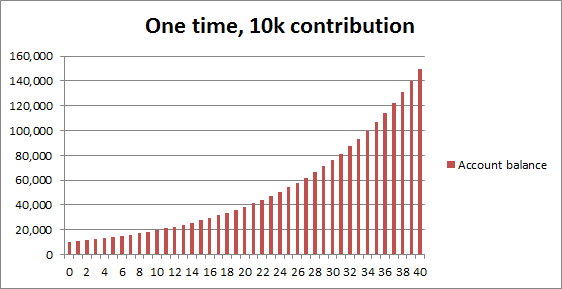 But what if I only delay my first 10k contribution and make it up next year? Well, look at the second graph again and note that with 39 years of investment your 10k will become 140k. So by delaying your contribution by one year you end up with 10k less? How does this make any sense? Consider this classic mathematical quizz. In a lake, there is a patch of lily pads. Everyday the patch doubles in size. If it takes 50 days for the patch to cover the entire lake, how long would it take for the patch to cover half the lake? Answer: 49 days. See what a difference a day makes? Blame the power of exponentiation. So how much do I actually gain by investing my money rather than keeping at in a checking or saving account? Look at Plan 1 again: by contributing only $400,000 in total, I end up with $2.15 million after 40 years. But better yet, let’s increase the contribution annually. In reality, you would expect your income to increase over time, which would allow you to contribute progressively more into your investment account. With a total of $787,000 in contribution, I end up with $3.17 million. The $2.4 million extra is a result of the power of compound interest. The moral of the story is: start investing today, like I did a week ago. If you do, best of luck. what did you invest in richard? ive been researching investments that bring better returns than cd’s or money market accounts, but haven’t really fully understood them yet. After considering my options, I decided to invest in individual stocks. I figured out that safe havens had been exhausted by the timid investors since 2008, resulting in lower-than-inflation yields. My investment goal is to at least beat inflation, and in the current economic environment, only stock investment would allow me to accomplish that. I have strong belief in several individual companies, and I want to learn as much as I can when I am still young and have a long time horizon. So I invested in companies I thought had great upside potential. You don’t have to pick stocks like I do; you can invest in an index fund which tries to match the overall trend of the stock market. If the index fund matches the S&P 500, that’s double-digit percentage annual growth! yeah, i’ve been considering index funds as they have lower risks than stocks. until i have researched and learned enough about stocks, ill have to play it safe. Index funds are not necessarily less risky than individual stocks. Index funds’ risk is stock market risk, and when something like the 2007 crisis strikes, they will go down at approximately the same rate as the stock market. Individual stocks mostly do their own things; they have their individual risks and a little bit of stock market risk. So it comes down to how you estimate each type of risk. If you believe that the stock market will go up in the long run, you should invest in an index fund; if you think it won’t go up, then don’t. If you believe Apple will go up in the long run, you should invest in its stock, etc. Thanks! Good luck with your investment strategies as well! Another aspect that you need to think about investment is tax. Hey, I have a question. Correct me if I am wrong. I am not sure why you invest in 401k but not roth IRA (or may be you do). For a young person like you, there is a high chance that you will need the money in 401k at some point. If I don’t get this wrong 401k, you can’t take money out until 59.5 years of age. If you do, you will end up paying 10% penalty + ordinary income tax. If you do cash ur 401k on time, the tax bracket in the future will probably is higher than the tax bracket right now. Even through, you earn interest on the deferred tax, will this interest sufficient to cover the tax hit later (tax bracket is lower in this economy???). Is roth IRA better since we pay tax up front, tax bracket now will be lower? In addition, you can take your money out on roth IRA any time (not the interest on the money that you put in there)? Please correct me if I am wrong. 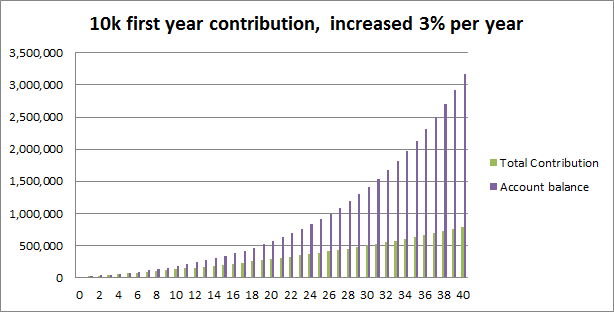 My employer offers contribution matching on 401(k) contributions, and I make the contributions post-tax because I believe that the tax rate at withdrawal will be higher than now, because I think I’ll have other sources of income when I retire (hopefully!) and I think that taxes will go up in the future. I don’t think you can withdraw money from an IRA account, but with an IRA account your investment options won’t be limited to what the company has available to its employees.